Many lay women today experience an inner call to deepen their Christian commitment; to give new spiritual meaning to their lives; to become part of a "wider circle" of people who share similar ideals and hopes. Some desire to express this in a more concrete way. It was for these reasons that the General Chapter of 2004 (a meeting of delegates from all parts of the world) gave approval for our sisters in the U.S. Region to begin to explore new form of belonging to a religious congregation, forms other than canonical vowed membership. Immediately following this assembly, a committee was established at the level of Central Leadership with a sister from the U.S., Canadian West and Quebec regions as members. 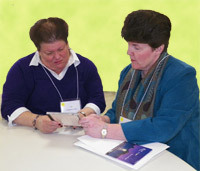 Here in the U.S., a local group made up of 5 sisters and 2 lay women was formed to study the possibility of a New Form of Belonging to Holy Cross, namely, the Companions. Four years and many meetings later we had put together a vision and written it down as a guide for formation.